"LUNDEENSD" CUSTOM LEADED GLASS SIDELIGHT BEVEL WINDOW FABRICATED BY JACK McCOY© IN ASSOCIATION WITH GLASS BY DESIGN. 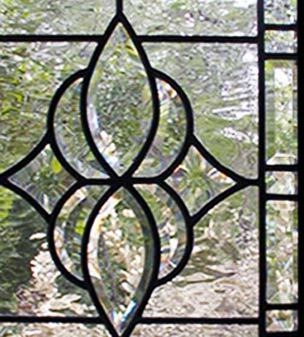 Custom leaded bevel glass sidelight window was 14" x 36". Clear textured leaded glass window with JS08 bevel set, Waterglass background and a beveled border.